So you’re in the market for a shipping container, you want a cheap price but not cheap service. The internet is a good place to start with loads of sites offering containers for sale. Just who are some of these people though? Before parting with your hard earned cash a good tip would be to ask to visit their depot to inspect the equipment you are being offered. The internet is swamped with traders and middlemen offering containers for sale they don’t own or have never seen. Ask to visit their premises, look to see their sign over the front gate and gauge for yourself whether you are buying from the source or merely someone chancing their luck and adding a few quid on for themselves. Buying from source will cut out the middleman and with a little bit of hunting around you could save a considerable amount. Container depots are often a good place to start. They act like shipping container warehouses and used to dealing in bulk. Here you could benefit from trade prices, with the added bonus of being able to view a selection of containers and pick the best one. If you need any container conversion work to be carried out then this will also be a good place to start. Most depots have been around a long time and do this kind of work day in and day out. They will quite often be experts in their field and you will be able to see their workshops in action and projects underway, getting a feel for their capabilities and standard of work. Another benefit of buying from a reputable depot is knowing that they will have trained and experienced inspectors and fitters and that any containers sold by them will be up to scratch. The added peace of mind comes from seeing a depot stacked with thousands of containers, and the knowledge that they are a going concern and not going anywhere. Don’t be taken in by an impressive website and smooth talking sales person, like most things in life if it sounds too good to be true it probably is. 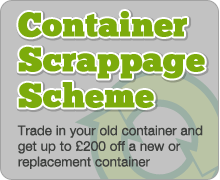 Visit a depot, inspect your container and save money and hassle.